After an event has finished – whether it was a huge success or a little bit disappointing – it’s often tempting to just ‘get on with it’ and look ahead to your next event, without giving the proper time and attention to evaluating the event just gone. So how do you approach a post-event evaluation? We’ve developed a free event evaluation template and have gathered event feedback form samples to help take you through the process. You can get relevant post-event attendee feedback in a number of ways.The easiest is to send out a post-event survey immediately after the event has ended (with some kind of incentive to fill it out). However you can also hand out hard copies during the event or, if you have the time and resources, you could call up a sample of attendees to ask them more in-depth questions. Additionally, you can create a focus group or, if you have one, ask your advisory group/steering committee. Introduction and thanks – it’s important to share gratitude for the attendee coming along to your event. You may also want to mention here why you’re collecting feedback, how and why the data will be stored and if the answers will be used publicly. Select your event – if you’re sending multiple event feedback forms you may wish to segment the answers by event. Overall rating – this is where you can ask a series of questions that will determine how the attendee found your event overall. Most event feedback forms will use a rating or scoring system (1-10) to make this as easy as possible for the visitor to fill in. Value for money or time – this is a good indicator of how valuable the attendee found your event and can be measured by time, money or another variable. Presenter or session evaluation – this is where you can gather feedback on any entertainment, presenters or sessions. Remember that not every attendee will have attended every session, so make this personalised based on their behaviour, or give them the option to easily skip sections that aren’t relevant. Venue evaluation – this will allow you to ask if the attendee found the venue easily, what they thought of the catering options and where else they might like you to host. NPS – this question, known as a “Net Promoter Score” asks “On a scale of 1-10 how likely are you to recommend this event to a friend or colleague?”. This allows you to evaluate whether your attendees are detractors (not likely to recommend your event) or promoters (likely to recommend your event). Thoughts and feedback – leave some space here for qualitative answers where your attendees can write any thoughts they have for improvement. This evaluation form is from our free feedback form sample download and offers lots of different methods to collect information including allowing attendees to draw on a diagram and to circle words which are most meaningful to them. Visual methods of evaluation are often more engaging and will encourage attendees to complete the form. 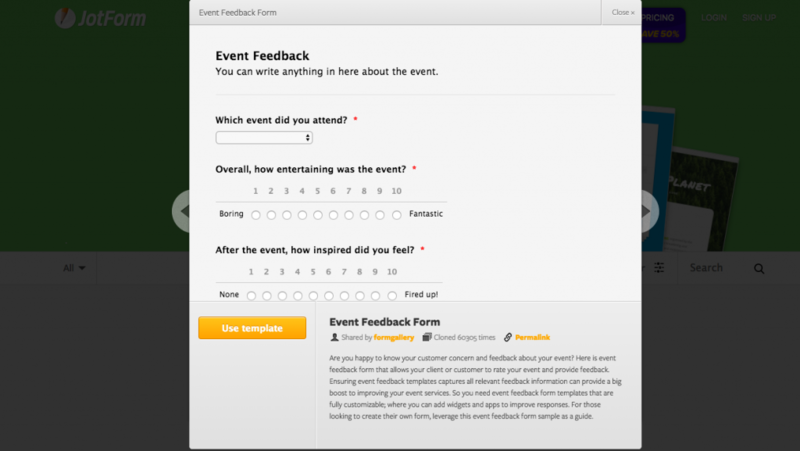 This event feedback form from JotForm is a good example of a form that attendees could answer in just a few minutes, by selecting ratings. The asterisk shows questions that are compulsory, followed by optional fields like contact details. 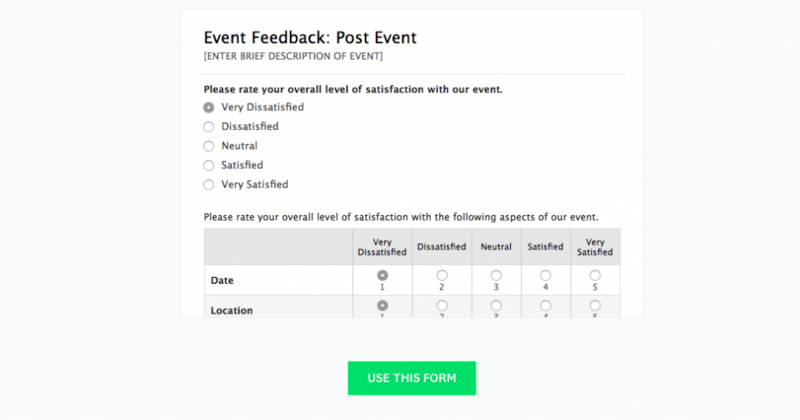 This feedback form from SurveyMonkey is a general feedback form which could be applied to any event with questions such as “How organised was the event?” and “What did you like about the event?”. The Wufoo post event survey makes it easy for reviewers to rank everything from food, to venue, in a single 1-5 rating system, potentially creating a better representation of thoughts for one section compared to another. You can get a lot from asking people questions, but you should also take a look at the raw data for your event. If you used Eventbrite to ticket it, then you can download your attendee list in an excel format in order to see all of the demographic information you asked for, as well as the answers to any custom questions you asked (such as ‘what are your main goals for attending?’ or ‘where did you hear about our event?’). Finally, you should aim to schedule some dedicated time for the team 1-2 weeks after the event has ended. It shouldn’t be too much later than this or memories will start to fade and valuable insights will be lost, but it also shouldn’t be the day after the event ends, as you need to let the dust settle, giving everyone time to reflect and prepare. Send this template to everyone attending the meeting and require them to spend time filling it out independently so they come prepared. Ensure all post-event data (such as survey answers) is available so the team can make informed contributions. Carve out enough time to not rush this, ideally a half-day or even a full day. It makes sense to start with the nitty-gritty and look at the details of your most recent event, including what went well, what can be improved and how you can focus more time and resources on the activities that delivered the most value to you and your attendees. Start the meeting on a positive note. It’s tempting to dive right into the parts that can be improved, but it’s just as important to recognise and celebrate the good aspects too. Successes: Celebrate what you did well! Did you reach and exceed your attendee numbers? Did you save money on a venue? Did you create a clever new format that everyone loved? Was your customer service team incredible this year? Make sure everyone in the team finds at least one achievement they’re proud of, celebrate it as a team, and see how it can be codified as a best practice, to be repeated and improved upon next year. The really important thing for tackling this part of the meeting it to make it about things and processes, not people. How can mistakes be avoided, processes improved and which tactics simply didn’t work as well as you’d hoped? Again, try to get at least one idea from the whole team, and celebrate it as a way of moving on, learning and growing as a team. This is essentially about efficiency – of time and allocation of resources. Has one of your actions produced good results, but taken an inordinate amount of effort to achieve? Is it really worth doing again? This is where looking at Return on Investment can really help you prioritise better than only looking at absolute results. What was the 20% that each team member did that achieved 80% of their results? Or what was the most important 20% of their day-to-day time spent on? Equally, what was the 20% of their work that delivered the least in terms of results? What could they drop for the next event, or outsource, or automate? If there is not sufficient data to make these kinds of decisions, how can tracking and measurement be improved for next year? Did this event support our mission? Start by reminding everyone what your company’s mission is. What aspect of the event most embodied the values and mission of our company? What aspect of the event was farthest removed from our company’s mission and values? Overall did this event live up to our ideals? Did this event support our customers’ needs? Time to review whether the event met the needs of your target customers. Who do you put on events for? Did the attendee list reflect who you were expecting to see there? If not why not? Who did/didn’t come and what were the surprises? Why did your attendees come? Did it achieve their needs? What was the most common suggestion for change? What was the most popular aspect of the event? Would they miss it if you stopped running the event? In addition, you should be checking whether your actual data support the personas you created. Has your customer demographic shifted? Now is a great time to re-evaluate your ideal customers, update those personas (or create them if you don’t have one!). Ok, so now you’ve looked back at the event you’ve just run, it’s time to take those reflections and start looking forward to your next event, and this time we start at the top: your strategy. Let’s break it into four parts. All good event strategy needs to start with the customer. Luckily, you’ve just reflected on this year’s audience, so you’re off to a flying start! However, you need to delve a little deeper again. To base your strategy on customer demographics isn’t that useful – you have to base it on their needs. What are their main concerns and opportunities? What does your event provide that they can’t get elsewhere? How does it scratch their itch? What would the negative consequences be if it weren’t scratched? Once you’ve answered these questions, you’re a long way down the road to a successful event strategy. Another nice way to look at it is, if you overheard your customer trying to describe your event to their friend, what would you want to hear them say about you or the event? Your strategy should then be to create an event that would match their description. While it’s top priority to cater to your customer, you can’t forget about your own needs either! What do you care about? Is it growth, profit, revenue, market share or something else entirely, like leads, donations, social media buzz etc.? Ideally, you’ll want to have one primary goal, and then 2-3 supporting goals. How do we measure our needs? “You are what you measure” is a common phrase these days. Once you’ve answered the above two questions, you need to put in place metrics that keep everyone focused on your agreed strategy. For example, if you care about growth, maybe you’ll focus on month-on-month ticket sales and not talk much about cost; if you care about profit then cost-per-acquisition may be much more important. Spend some time working out with the team how you’ll reflect your key goals in terms of metrics, and ensure everyone is on the same page in terms of what ‘”success” looks like. The last part in this section, you have to recognise that you never operate in a vacuum, so it’s always worth undertaking a classic SWOT analysis to think about your Strengths, Weaknesses, Opportunities and Threats. Strengths: Do you have the best trained staff? The most connected sales people? The best known brand? Strengths should be company-specific attributes that give you a market advantage and are difficult for competitors to replicate. Weakness: Do you have a high staff turnover? Poor attendee retention rates? Very low margins? Weaknesses are typically internal pain points that are within your control to rectify. Opportunities: One opportunity will be to address your weaknesses, but typically you should be looking at a broader market context. Are new technologies disrupting old competitors? Could you create another event in a new location? Threats: Again, these would normally be driven by external factors such as the market. Are sponsors cutting budgets due to a global economic downturn? Could your biggest competitor launch a similar event? Audacious: If you’re really going to break the mould and put on exceptional events and attract the most ambitious and capable staff, then your goals should be big, ambitious and exciting to motivate everyone. Having these aspirational goals will go hand in hand with having a motivating mission, making the team’s work tangible. These kinds of goals might be to double the size of your event year on year; get mainstream press coverage of it next year, have a big celebrity endorse it (and attend) through a strategic influencer marketing plan, or simply make it the largest, global ‘must attend’ event of its kind. Don’t set too many of these. Ideally you should just have one or two that the whole team can get behind and support, otherwise you’re asking for too much, fragmenting resources and thinking too tactically for this section. You’ve probably heard of SMART goals before. They should be Specific, Measurable, Achievable, Relevant and Time Bound. While it’s important to have stretch goals (as described above), they should still be SMART, so you don’t chase the wrong things, or set everyone up to fail, which can obviously be motivating. In this section, try to break down your big audacious goal(s) into 1-3 supporting smart goals the team can target. It’s also important to break goals down into smaller chunks so you can see incremental progress (or course correct if the progress isn’t there before it’s too late). The timeframe for milestones will depend on your team and the goals, but they would probably be weekly, monthly and, at most, quarterly – whereas your larger goals might be annual and tied to the completion of the event. Last but certainly not least in the event review process, you need to actually turn all of your brainstorming and ideas into a plan! How do you actually execute your strategy and achieve your goals? Think about these three things. Does your current team possess all the right skills needed to execute your vision? Do you need to hire more people? Or do you have enough manpower, but they need training and up-skilling? What about other resources such as new technology? Do you have the right content management system? The right marketing automation? Is there sufficient marketing and promotional or design budget? What specific ideas do people have to grow your event or make it better? Should you focus on email marketing, social media or blogging? Should you outsource production or bring it in-house? Do you need new software or a new website? Has someone got a cool new campaign idea? What partners should you be approaching? This is a great time to brainstorm specific tools and campaign ideas to test for next year. Go back to your notes on successes and mistakes from the event you just ran. Can you put in place specific workflows, reviews or sign-off processes, collaborative tools, or other efforts that will help you sustain best practices and avoid bad ones? If so, note them down in this section. Download the complete event evaluation template now by filling in your details on the form on the top right. Good luck!